The book starts with an introduction to the Firebug world, explaining what the tool is for and continues with a description how to successfully install Firebug into your browser. All you need to know if you want to get started with Firebug and tune your web site to perfection. The next part of the book explains basics of Firebug user interface and gives you an overview of all the panels in Firebug. This is great even for those who have basic understanding of web development and Firebug. The last part of the book is the most interesting and I believe useful even for advanced web developers and Firebug users. It covers top 17 features you'll want to know about. This is great place to learn some tips & tricks about HTML inspection, editing as well as AJAX debugging or page load performance monitoring. If it sounds interesting, just go ahead and learn new stuff ! I was also a technical reviewer for both books. 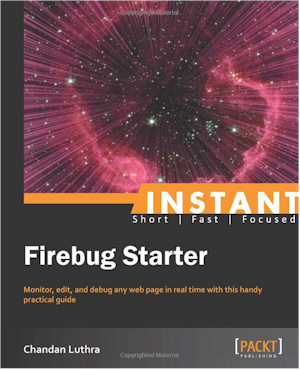 Don't expect Firebug Starter to be long, it is only 45 pages but it is an excellent guide to Firebug's features. @Mike: yeah, I know about that! Your name is everywhere.